Ho! Ho! Ho! This tasty and Charming Buttermilk Honey Shaped Santa Bread is as whimsical as he is delicious. With my easy to follow step-by-step instructions, he’ll be on your holiday table in no time. Since the theme for December’s #TwelveLoaves is holiday bread, and I couldn’t think of anything more appropriate than to have Santa come for a visit. Stick with me as I show you that making this festive shaped Santa bread is easier to make than you may think! **Please Note – The printable recipe card with detailed instructions, complete ingredient measurements, and nutritional information for making Buttermilk Honey Shaped Santa Bread is available near the end of this post. The recipe I’m sharing here is a good one. However, if you’re interested in making a Shaped Santa bread, but don’t want to go to the trouble of making your own dough, by all means, you can buy some store-bought frozen dough and follow the thawing and rising directions on the package. Then proceed from that point using the steps I’m sharing for assembling this adorable Shaped Santa Bread. Don’t be afraid to apply pressure to the dough pieces you use for making all his facial elements. Since bread dough is elastic, it may take you a bit of working with to get the dough to conform to what shape you’re trying to achieve. Don’t forget to lightly flour your work surface, but make sure not to over-flour. When attaching pieces of dough to one another, use a bit of tap water and a little light pressure to press the pieces gently to each other but without distorting their shape. When making slits in Santa’s beard and mustache, deeper is better, and a sharp paring knife is essential. Going over the same cuts more than once is better than trying to cut too deeply on the first slice. I wish I would have followed my own advice on this step because many of my cuts kind of disappeared once Santa spent time in the oven. *Note – The cutting is optional but adds a fun bit of detail. Finally, if you’ve decided to add color to Buttermilk Honey Shaped Santa Bread after baking, please, please, please dilute your food coloring with plenty of water and test a small area first. The object is to give Santa a light kiss of color and not to make him into a beacon in the night. That’s Rudolph’s job! In the bowl of a stand mixer with the dough hook, combine 3 cups of flour, the foamy yeast mixture, buttermilk, butter, honey, and salt. Mix in an additional 3 cups of flour and mix until the dough forms a softball. Turn the dough out onto a lightly floured surface and knead by hand until the dough is smooth and elastic. *Note – You may need to work in the remaining ½ cup flour if the dough is extremely sticky. Spray the inside of the bowl lightly with olive oil spray. Return the dough to the bowl and spray the top lightly with olive oil. Cover the bowl with plastic wrap and place the bowl in a warm, draft-free place until the dough has doubled in bulk (approximately 1 hour). Turn the risen dough out onto a lightly floured surface and divide the dough in half. Working on a baking sheet that has been lined with parchment paper, press half of the dough out to form a slightly oblong oval (approximately 1″ thick) in the center of the baking sheet. This is the base for Santa’s face. 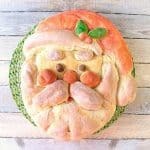 Cut off approximately 1/3 of the remaining dough ball and form a modified “U” shape which will form Santa’s beard. Make sure to leave more dough at the bottom of the shape and taper it on each side. Use water to adhere the beard to Santa’s face, pulling and patting until you get your desired shape. Cut off another piece of dough from the remaining ball and form it into a slight boomerang shape. This will be Santa’s hat. Adhere the hat onto the top of Santa’s face using water and pressing and pulling it into your desired shape. *Note – I pulled and pushed the dough for Santa’s hat down on the right side at a jaunty angle. Cut another piece of dough from the remaining piece and form a long, modified triangle shape. This will be the trim on Santa’s hat. Adhere the trim to the hat using water and pressing it into place. 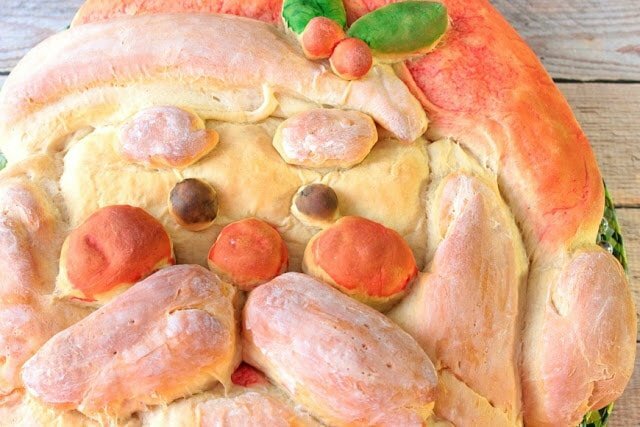 With the remaining dough, pinch or cut off pieces that will form 2 sides of Santa’s mustache, 1 nose, 2 cheeks, two eyes, holly leaves and berries (if desired), and the ball at the end of Santa’s hat. Attach all the elements with water. Use a very sharp paring knife to cut slits in Santa’s beard, and also to add details to the holly berries. *Note – It’s easier to make several shallow cuts than one deep one. The deeper cut shallow cuts, the more the details will show after the second rise and bake. Place the completed Santa in a warm, draft-free place to rise a second time (approximately 45 minutes). Once risen, preheat oven to 375 degrees and bake Santa in a preheated oven for 35-40 minutes, or until he’s golden brown and sounds hollow when tapped. Cool Santa completely. If adding color, mix a small drop of each of the colors with about 1 tablespoon of water. Use a clean paintbrush to lightly brush color onto Santa’s hat, beard, eyes, cheeks and nose, and holly berries. If you’d like a deeper color, add two or more coats, drying in-between each coat. Once you’ve assembled Santa’s shape, and have allowed him to rise and bake, you can decide if you’d like to add a little festive color to him by using food coloring that’s been thinned with water. Or, you can leave him plain and golden brown. The call is yours! But either way, you make him… just make sure you do! Making this Shaped Santa bread will hopefully become a fun family tradition that you can pass down for generations. Below is the printable recipe card for today’s Buttermilk Honey Shaped Santa Bread. If you’ve enjoyed this recipe and look forward to making it (or have already made it), I’d appreciate if you’d take a moment to give it some feedback by way of stars near the comment section at the end of this post. Thank you so much! Ho! Ho! Ho! This tasty Charming Buttermilk Honey Shaped Santa Bread is as whimsical as he is delicious. With my easy to follow step-by-step instructions, he'll be on your holiday table in no time. In the bowl of a stand mixer with the dough hook, combine 3 cups of flour, the foamy yeast mixture, buttermilk, butter, honey, and salt. Mix in an additional 3 cups of flour and mix until the dough forms a softball. Turn the dough out onto a lightly floured surface and knead by hand until the dough is smooth and elastic. *Note - You may need to work in the remaining ½ cup flour if the dough is extremely sticky. Turn the risen dough out onto a lightly floured surface and divide the dough in half. Working on a baking sheet that has been lined with parchment paper, press half of the dough out to form a slightly oblong oval (approximately 1" thick) in the center of the baking sheet. This is the base for Santa's face. Cut off approximately 1/3 of the remaining dough ball and form a modified "U" shape which will form Santa's beard. Make sure to leave more dough at the bottom of the shape and taper it on each side. Use water to adhere the beard to Santa's face, pulling and patting until you get your desired shape. Cut off another piece of dough from the remaining ball and form it into a slight boomerang shape. This will be Santa's hat. Adhere the hat onto the top of Santa's face using water and pressing and pulling it into your desired shape. *Note - I pulled and pushed the dough for Santa's hat down on the right side at a jaunty angle. Cut another piece of dough from the remaining piece and form a long, modified triangle shape. This will be the trim on Santa's hat. Adhere the trim to the hat using water and pressing it into place. 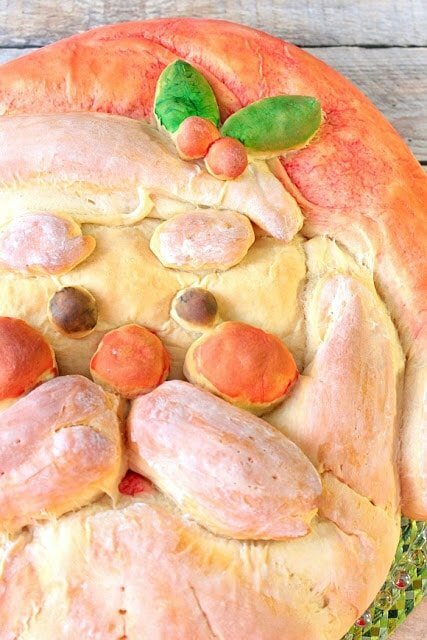 With the remaining dough, pinch or cut off pieces that will form 2 sides of Santa's mustache, 1 nose, 2 cheeks, two eyes, holly leaves and berries (if desired), and the ball at the end of Santa's hat. Attach all the elements with water. Use a very sharp paring knife to cut slits in Santa's beard, and also to add details to the holly berries. *Note - It's easier to make several shallow cuts than one deep one. The deeper cut shallow cuts, the more the details will show after the second rise and bake. Place the completed Santa in a warm, draft-free place to rise a second time (approximately 45 minutes). Once risen, preheat oven to 375 degrees and bake Santa in a preheated oven for 35-40 minutes, or until he's golden brown and sounds hollow when tapped. Cool Santa completely. If adding color, mix a small drop of each of the colors with about 1 tablespoon of water. Use a clean paintbrush to lightly brush color onto Santa's hat, beard, eyes, cheeks and nose, and holly berries. If you'd like a deeper color, add two or more coats, drying in-between each coat. I sincerely hope you’ve enjoyed today’s Buttermilk Honey Shaped Santa Bread as much as I’ve enjoyed bringing it to you! If you have any questions or comments for me regarding this Shaped Santa Bread, I’d be happy to answer them for you in the comment section. I want you to be successful and completely at ease if you decide to make this bread (and I hope that you do), so anything I can do to help, I’m here for you! Listed below are all the other participants in the December #TwelveLoaves holiday bread baking challenge. I hope you’ll take a moment to visit them and give them all a little love. 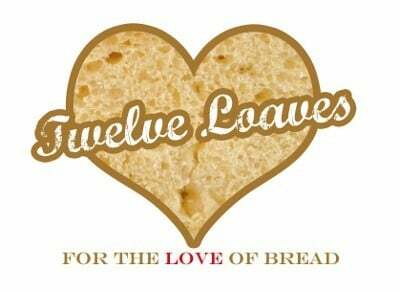 If you’d like to bake along with us this month, share your Holiday Bread using hashtag #TwelveLoaves! What a wonderful recipe, Renee! I love how you broke down each of the steps and made it look so easy. This is a recipe I would love to make with my daughter this Christmas. This is absolutely adorable! I love the flavors going on too…a touch of honey is such a lovely addition to bread! Renee, your Santa is absolutely g o r g e o u s and I'd be honored if you agreed to share your link on my blog, where I have opened the "Santa Showroom". I wish you a wonderful time and lots of fun and success with your baking and paintings, which are the most amazing, I've seen. When I saw the title of your recipe I could not wait to see if it was similar in idea to me and how they would compare. Same concept very different routes taken and totally different results. I just love your Santa! That's incredible! I'm pretty sure if I tried that, I'd have all of the appliques falling everywhere. Such amazing talent! This is seriously impressive. WOW! I cannot get over this bread! Santa looks amazing! You did such a fabulous job with this! Love it! You did such a fantastic job with this, Renee! What a fun thing to make and serve at Christmastime. Aww, yay! It's this recipe! I saw the picture somewhere (maybe IG) and was totally in awe. 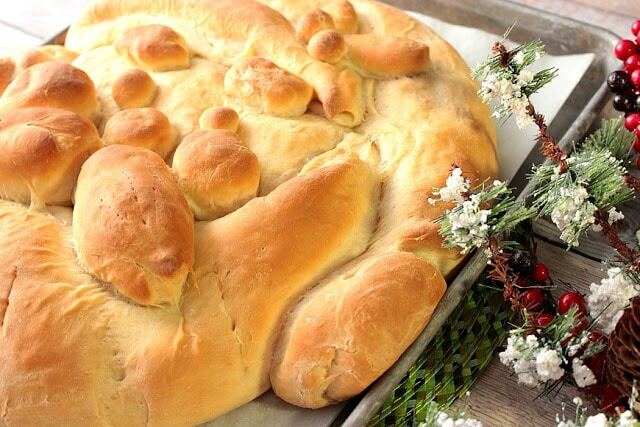 You do such amazing things with bread – this is such a gorgeous loaf! I wish I could do the same. You make it look so easy! I absolutely love this bread, you are so incredibly talented! OK this is just brilliant and not to mention ADORABLE!! I love the subtle colors from the food coloring. So cute! This is SO cute and just clever! I love it! You are so talented! 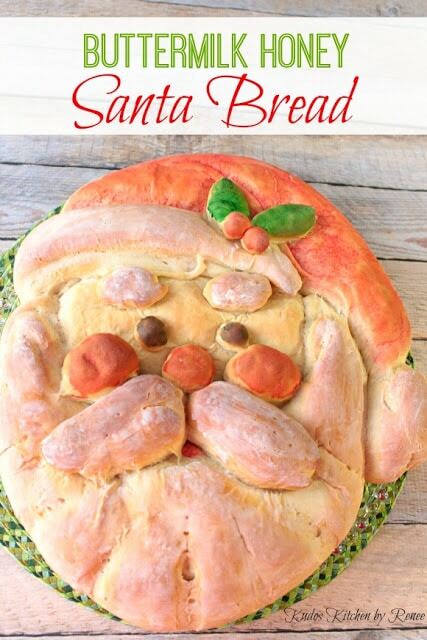 This santa bread is just perfect! Renne – I've been anxiously waiting to see this recipe after you shared sneak peeks on Facebook! This is fantastic! 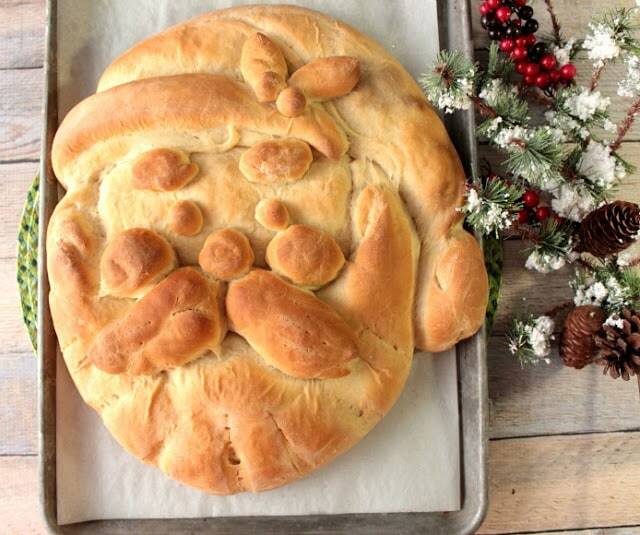 I saw this santa bread on your facebook and totally fell in love with him! I wish I was that talented with bread! The's just perfect! 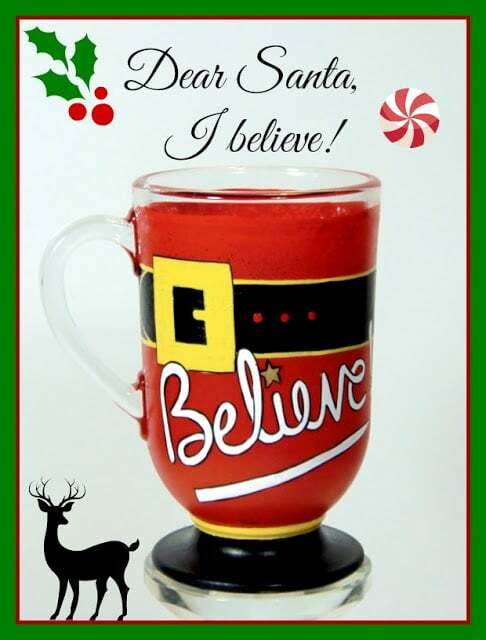 This would be adorable on a table for Christmas brunch! You know what? I was so ridiculously busy that I couldn't bake for Twelve Loaves this month…but guess what? THIS is what I'd originally planned on making! Yours turned out so perfect – that face is adorable. I hope I find the time to make a loaf for Christmas. You are off the hook! This is so cool. I'm not patient enough anymore to do recipes like this but I'm so totally impressed. Props to you! This might be the COOLEST bread I've ever seen in my entire life. You deserve a bread baking award for this. This is AMAZING!!! Seriously you are the most talented bread maker ever! 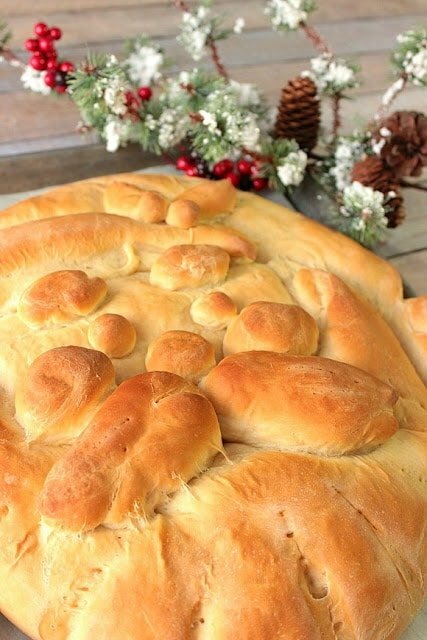 This bread is perfect for Christmas. I am so happy I happened to spot this on Pinterest yesterday. I got up this morning and baked it up!! This recipe is fantastic..if anyone is nervous about it..don't be. The dough is a dream to work with and it holds its shape fantastically. The end result is a super soft bread (thanks to the buttermilk) in the shape of Santa..I mean,how neat is that 🙂 My Santa face sort of had a mind of his own and his left side..mustache and cheek decided to kind of go off on their own..haha It still looked perfect and once you lightly paint him,he will come alive right before your eyes. The bread itself would also make excellent 9×5 inch loaves which I plan to make after Christmas. I already have plans for next year..I think Santa needs a friend..perhaps Rudolph? Thank you thank you for a fantastic recipe,easy to follow instructions and pictures..thank you for those. I am a visual person and loved having them handy. Merry Christmas from an American all the way in The Netherlands!! 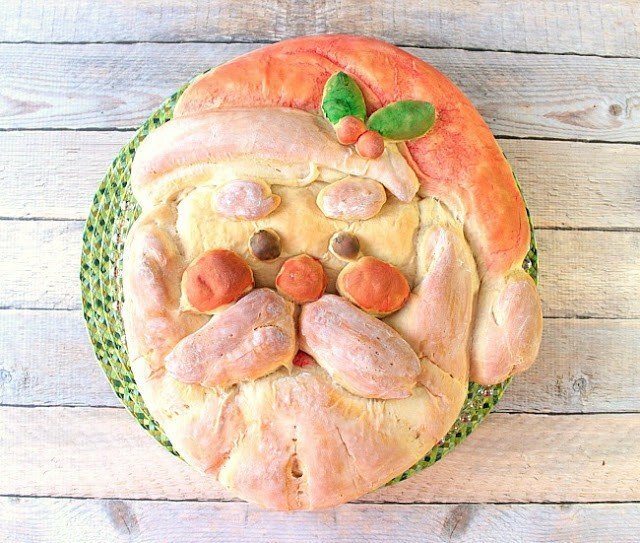 Such an incredible recipe, this Santa Bread looks like a piece of art! My kids will LOVE making the recipe with me! Kid tested, and approved!! 🙂 Have fun!! I’m so glad. They’ll have a blast making him! Merry Christmas! This looks absolutely unique and beautiful. I am going to make this and take it to a party we’re going this holiday season. Everyone will love it! You’ll be the hit of the holiday party! Have fun! !